God Bless America. Let's do this! Mortal Kombat is one of the "Big Two" fighting games (the other being Street Fighter). It's gone through many different changes and versions through the years, and I'm not sure exactly which version of Mortal Kombat this comic belongs to, so I'll just touch on Mortal Kombat in general for a moment. Mortal Kombat is basically a fighting game. Two characters face each other on an arena stage an fight using various powers and abilities until one of them goes down. It's an extremely simple concept, which is why, for the life of me, I've never been able to figure out how come there's so much convoluted backstory to the characters when in the game itself none of it matters. All that matters playing the game is that you know the various button combinations to beat down your opponent and at the end of it all, deliver a humiliating finishing move. As a game, Mortal Kombat is a tried and true genre classic that's been around for close to 30 years (first game was released in 1992). To tell the truth, I've never liked it that much. Yeah, the "fatality" moves at the end of the match are fun, and the graphics have always been great, but I've always liked the more "animation" art style of Street Fighter or Samurai ShoDown if I'm going to dump quarters into a game. That said, Mortal Kombat is popular enough to spawn 30 years' worth of games, movies, cartoons, toys, and comic books. What we have here is a comic that delves into one of the peculiarities of Mortal Kombat. . .characters that are basically the same, but just a different color. It still baffles me that there is so much background material and story to characters that basically stand across from each other throwing and blocking punches. It baffles me even more that someone felt they had to go into the background of what's obviously a lazy solution to providing a large roster of game characters to choose from while still maintaining a memory resource budget. But here we are. Let's take a look. . .
Kitana, the daughter of Outworld Emperor Shao Khan, explores a neglected area of his castle and finds a secret room filled with treasure. As she reads a book discovered among the hidden wealth, she is shocked to discover that she is actually the daughter of the kind and benevolent ruler of the realm before it was conquered by Shao Khan thousands of years before. Shao Khan appears and finishes the story for the enraged Kitana. . .he placed her under a spell that not only made her immortal, but also wiped her memories of her past life so that Kitana believed she was Shao Khan's daughter. He also reveals that Kitana's sister, Mileena, is not actually her sister, but a clone created from Kitana in an effort to make a more perfect version of Kitana that would serve Shao Khan better. At the end of his confession, Shao Khan reveals that Kitana is the one he truly loves and Mileena is nothing but a failed experiment. Then he recasts the spell of forgetfulness on Kitana so she remembers none of what happened. . .never realizing that Mileena has been eavesdropping the whole time and now knows everything. That was more effort than one would expect to be necessary to explain why there's two identical ninja-women with pretty much the same abilities (they do use different weapons) but different colors in an arena fighting game. The story isn't BAD, but this comic is basically one long piece of exposition to explain something that doesn't really need to be explained. Since this is from 1995, I see it as a sort of fan fiction from an era when the internet wasn't as prevalent as it is now. 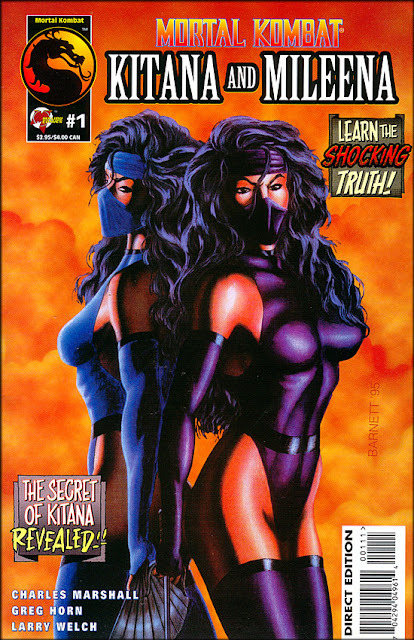 Of course, Kitana/Mileena fan fiction these days would surely be of quite a different flavor than this comic. . .BUT I DIGRESS! The art is pretty nice and very well-colored, but it's fairly standard superhero fare that tells the story but doesn't strive to stand out. Unfortunately, the decent art is in service to a story that isn't going to matter to anyone but superfans of Mortal Kombat that just HAVE to know every detail about the video game characters hopping around their screens. Overall, this isn't a terrible comic, but I fail to see it appealing to anyone except obsessive fans of Mortal Kombat and maybe those who are into scantily-clad ninja women in general. So now we have a comic representing the other "Big Two" fighting game, Street Fighter. Street Fighter has actually been around a few years longer than Mortal Kombat (first game released in 1987), and I have to admit that I like it better than MK pretty much just because of the more cartoony/comic book art style. Fighting games are honestly not my favorite genre, but if I'm going to dump quarters into one, I like it to be something I want to look at. To tell the truth, I've always considered Samurai ShoDown to be better than either Mortal Kombat OR Street Fighter, based on its fantastic art style and weapon-based combat. . .BUT I DIGRESS! Like Mortal Kombat, Street Fighter is basically two characters standing across from each other on a combat stage and using abilities and special moves on each other through timed button combinations until one of them goes down. It's an extremely simple concept that has definitely stood the test of time. Also like Mortal Kombat, Street Fighter has spawned a whole "universe" of material outside of the game itself and the many versions and sequels through the years. . .including movies, cartoons, toys, and comic books. And ALSO like Mortal Kombat, Street fighter has that same baffling concept of having a convoluted ongoing storyline behind every character that doesn't matter one single bit when playing the game itself. There's the games. Now let's take a look at this comic book. 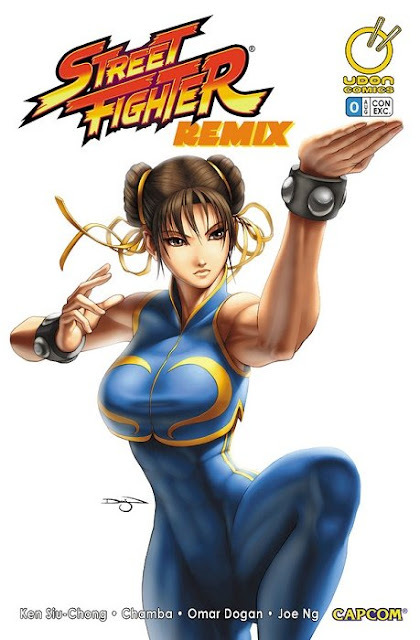 . .
M. Bison tests a laboratory-grown fighter by sending her to Jamaica to capture musical street fighter Deejay. To be continued. . . Right off the bat, this comic leaves a bad taste in my mouth by committing what I consider to be the cardinal one shot sin. . .ending on a "To Be Continued". The story itself is very short and is basically a fight scene, but the Manga-Style artwork is outstanding! Overall, despite some great artwork, not a good start for this comic. Former street fighter champion Sagat plots his revenge against the man who defeated and permanently scarred him. . .Ryu. To be continued. I see from ANOTHER "To be continued" ending (and reading forward to see two more) that this one shot is actually more of a preview for (then) upcoming Street Fighter ongoing series. This story is little more than Sagat raging about Ryu while punching a wooden post. The art is a similar Manga style to the first story, but not quite as good. Overall, this isn't really a story at all. It's just a pretty nicely illustrated short preview of an upcoming series. Moving along. . .
As Chun Li and Fei Long spar before a big Street Fighter tournament, they discuss the opponents they will be facing, without realizing that M. Bison is spying on them. To be continued. . .
*sigh* Another "To Be Continued". To tell the truth, I liked this story (or what there was of it) better than the others in this comic because it's basically a sort of recap or info dump on a handful of familiar Street Fighter characters, including my own personal favorite from my arcade days, Dhalsim. I always liked playing Dhalsim because NOBODY played Dhalsim. He was easy to beat if you didn't know how to use him right, and learning how to use him right wasn't easy at all. I knew how to use him right. I ALWAYS loved winning with what most people considered the weakest character. So extra points for some great art and having my old favorite Street Fighter character (even if it's just two panels), but this is more of an info dump leading into an ongoing series than an actual story. Two thieves realize that they picked the wrong pizza parlor to rob when they get beaten down by two veteran street fighters who don't like their peaceful family dinner interrupted. To be continued. . .
Yep. Another "To Be Continued". I have no idea who any of these characters are (Maybe from one of the more recent console Street Fighters?) but this story doesn't make me want to learn. Like the rest of the stories in this comic, it's very nicely illustrated, but that doesn't save it. Overall, I was pretty disappointed with this one shot. It's basically a preview comic for several (then) upcoming Street Fighter ongoing series, and more like something one would pick up on Free Comic Book Day than something costing $3.95. The stories are all very well illustrated with a great Manga style, but they're all just incomplete snippets. Some nice art doesn't justify charging full price for a handful of previews. Let's just move on. . .
Like Mortal Kombat and Street Fighter, Tomb Raider is a genre-defining game series that has stood the test of time. The genre in this case being puzzle-based exploring. The first game came out in 1996 and quickly became one of the most popular game franchises in existence, spinning off into multiple sequels, movies, and comics. The series recently rebooted to feature a younger version of the main character and remains just as popular as ever. Let's put it this way. . .if you've never heard of Tomb Raider, you've never played video games. The games themselves are fairly simple in concept. You have a sort of female version of Indiana Jones named Lara Croft in search of something (usually an item or place connected with some sort of real-world legend). She travels to various exotic and/or dangerous places around the world, solving puzzles and defeating enemies to achieve her goal. The storylines based in actual legendary places and events, along with the intense satisfaction gained when you solve a puzzle, are what makes this game series great. The newer games in the series, with huge open worlds, fantastic graphics, and amped up action are one of the few cases where a reboot greatly improves upon the original, and I can heartily recommend them to anyone looking for games that are worth every penny paid. The older games are pretty good, but vary wildly in quality. The new ones are modern classics, in my extremely humble opinion. But those are the games. Here's a Tomb Raider comic. Lara Croft steals Al Capone's hat from a wealthy gangster in order to retrieve a map to a secret vault hidden inside it. Lara evades the pursuing gangsters and finds the long-lost vault deep in forgotten subway tunnels, only to discover that just because something was once considered valuable, it doesn't always stay that way. . .
After two disappointing video game-based one shots, we finally get a good one! This is an extremely quick and perfectly bite-sized story that really captures the flavor of Tomb Raider. The stellar creative team ( DC Superstar Geoff Johns with some of his early work and veteran penciller Mark Texiera) give us an almost PERFECT example of what a one-shot is supposed to be, combining snappy writing and great cinematic artwork for a story that is told in the confined space of a single issue without a bit of meat wasted on the bone. Add in a twist ending and THIS is a beautiful little piece of Longbox Junk! Overall, this is what a one shot is meant to be. A great creative team stepping up to the challenge of telling a complete story in one issue and knocking it out of the park. If I have one complaint, it's that this is an EXTREMELY quick read and is over way too fast. Other than that, this is an overlooked nugget of pure Longbox Junk gold. And for our last video game-based one shot. . .
Vigilante 8 was a game that was sort of riding on the popularity of another, more popular and genre-defining game. . .Twisted Metal. Like anything else that becomes a success, there's gonna be some imitators trying to get in on a piece of the pie. Twisted Metal pretty much created the genre of vehicle combat games. . .with dark and creepy characters driving heavily-armed "theme" cars (Psycho clown driving an ice cream truck, for example) and going up against each other on large open stages with interactive elements. Twisted Metal was hugely popular for quite a while, but has pretty much vanished as a no-show on the current generation of consoles, with the last game being put out in 2012. Vigilante 8 was released during Twisted Metal's heyday in 1998, and was actually pretty well received, but it was definitely overshadowed by the more popular game. 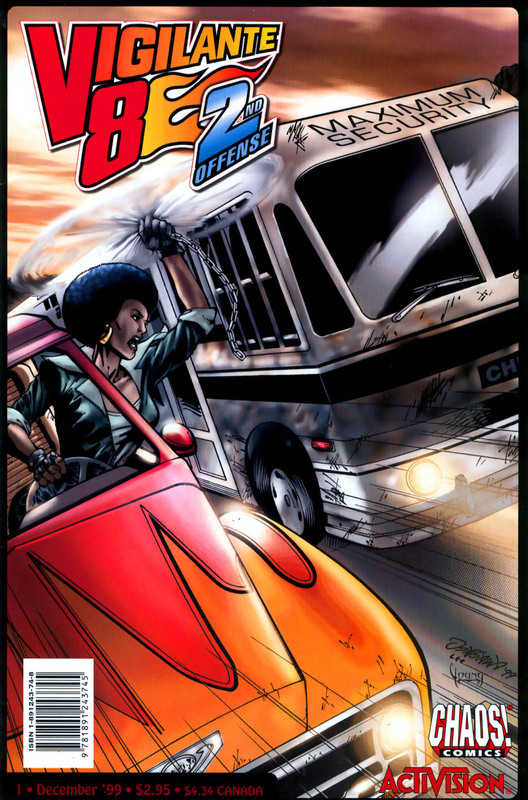 The gameplay itself was a virtual clone of Twisted Metal, but in a 70's setting with big 70's cars and semi trucks. The story revolved around an oil crisis in 1975 leading to the downfall of the U.S. and vigilantes with armed cars trying to preserve law and order in the American Southwest as the rest of the nation falls into chaos. It was a bit more story-oriented than Twisted Metal, which thrived on a more combat arena "last man standing" style. To tell the truth, I liked Vigilante 8 better than Twisted Metal for its more "American Mad Max" storyline and awesome 70's soundtrack. . .well at least I liked it better until Twisted Metal: Black came out. Now THAT'S a great game! BUT I DIGRESS. . .
Vigilante 8 got only one sequel (Vigilante 8: Second Offense) released the year after the original came out, but I never played it. It got pretty bad reviews, so I went ahead and skipped it. 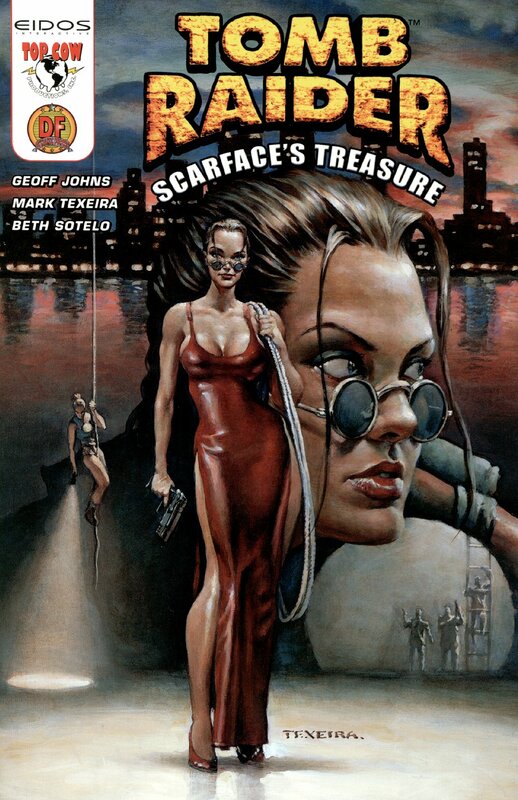 The comic book at hand is based on this sequel. In the far off future of 2017, a former hero of the "Vigilante 8" steals a time machine in order to travel back to 1977 and kill Convoy ( the leader of Vigilante 8) as part of a plan to control the world's oil supply. Vehicular mayhem ensues as Convoy's friends gather to avenge his death and stop their former comrade's nefarious plan, ending with Convoy's girlfriend using the time travel device to go back and change her lover's fate. Okay, this one was pretty bad. 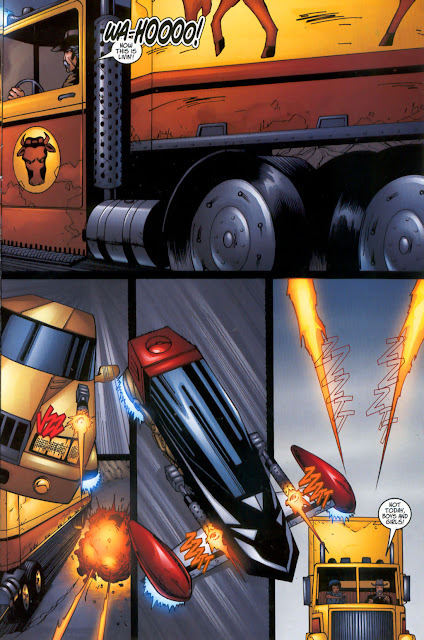 I have some fairly good memories of the original Vigilante 8 game, and this comic just sort of grinds its foot right into them. It's just a hot mess all around. The story makes very little sense. The dialogue is overblown and cheesy. Characters just sort of appear and disappear at random and without any explanation as to who they are or why they are there. The whole mess is built on the extremely shaky framework of assuming the reader knows the details of Vigilante 8's storyline. . .which might have been plausible in 1999, but forced me to the 2019 wiki well of knowledge for a refresher. And even WITH that refresher, the story was still pretty bad. To make things worse, the art is pretty sub-standard. For a story based on armed vehicles battling it out, one would THINK an artist who could draw good vehicles would be on deck for the project. The vehicles in this comic look like they were doodled by a bored high school kid during detention. Overall, this one shot just looks rushed and sub-standard in almost every way. I was surprised to find this in my daughter's collection, but when I asked her where she got it, she just shrugged. After I got done reading this relic of the 90's tying into a copycat sequel of a more popular game, I did the same. And so we come to the end of the Longbox Junk Video Game One Shots Special! The back half of these video game-based one shots definitely had more good than bad. Really, there was only one good comic out of the four at hand. Pretty disappointing. I just feel sort of. . .sad. There's a lot of missed opportunity here. A lot of wasted time and talent. I don't even know what else to say. DOCTOR DOOM! Let's learn how he turned into the gentle man we all know and love. Marvel's 2006 Books of Doom 6 issue mini. Be there or be square. . .Doom wills it to be so! Though I'm not a gamer, that Tomb Raider one-shot sounds interesting. When you have a good creative team, they usually can manage to make the mundane enjoyable. I'm looking forward to the Doctor Doom mini up next since I wasn't collecting at that time. I always enjoy seeing what's out there that I may want to try to add to my collection. Thank you! Cool Street fighter cover. Kitana was always my favorite in the game, and beat the entire game in my youth with her character. My friends used to hate when I picked her and whipped up on them haha. Now Tomb Raider, I know very little about. I have not played the games, and passed on the movies. So this is very helpful in learning more about what I have missed out on. Vigilante 8 is completely new to me. Interesting. Now I do know one other member here that may really enjoy your next review on Doom.